Emma Bovary committed suicide, but not before scandalizing her marriage with affairs and casting her husband Charles and young daughter Berthe into total financial destitution. For the next year, Berthe watched helplessly as her father slowly wasted away, succumbing to a broken heart. Now, only 12 years old, Berthe is an orphan. Following her father’s burial, Berthe is sent to live on her paternal grandmother’s farm, where she hoped to finally find the love and compassion that her mother denied her. Instead poor Berthe is treated as nothing more than an unpaid maid and farmhand. During her time at the farm, Berthe meets the famed artist Jean-Francois Millet and models for him. Her time with Millet gives her a brief glimpse of what it feels like to be appreciated and admired. But all of Berthe’s self-respect quickly dissolves when she and the farm boy Renaud are caught in a compromising position by her grandmother. Scared of her grandmother’s wrath, Berthe runs, eventually making her way to Renaud’s house—only to catch him in a compromising position with one of the local girls. Returning home to take her punishment, Berthe finds her grandmother’s lifeless body on the kitchen floor. Now 13 years old and totally alone, Berthe must depend on her strength and ingenuity to make her way in the world. With dreams of having money and all the finery it can buy, Berthe resolves to rise above her mother’s scandalous memory and to find the one thing her mother never could: true love. Similar to the way a sequel to Gone with the Wind was commissioned 71 years later, Madame Bovary’s Daughter is Linda Urbach taking on quite a challenge by penning a faux sequel to a famous literary novel more than 150 years later. Using reimagined and embellished flashbacks of the original, Ms. Urbach crafts a plausible and riveting continuation of a prominent classic that perfectly captures the essence of the era, yet at the same time has a modern, comfortable feel. 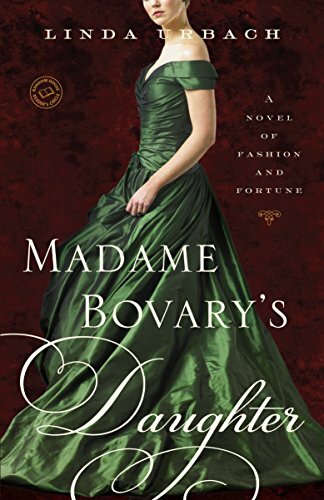 Additionally, seeing the flashbacks through Berthe’s eyes, gives those who have not read Gustave Flaubert’s Madame Bovary all the information they need—perhaps in an even more comprehensive and accessible manner. Whereas Flaubert portrayed Emma Bovary as having a strong narcissistic streak and a rather whiny constitution, as she pined away for the material things that she did not have; nor, did she try very hard to change her circumstances—short of having affairs with rich men. Although Berthe seems to have the same material wants as her mother, she is not afraid of getting her hands dirty. Infused with rigid determination and an almost thug-like mentality she sets out to make things happen. Though the rags to riches story of the orphaned Berthe Bovary exhibits many Dickensian traits—with a pinch of Cinderella thrown in—there’s more than enough of Linda Urbach’s style and finesse, to provide just the right catalyst to meld the smooth, flowing prose into a coming-of-age story that is simply magnetic. Linda Urbach preserves the integrity of a classic, while adding another sparkling gem to the literary crown.